Want to escape the not-always-pleasant climate of your town? Key West is an island paradise with something for everyone; whether you’re traveling with beach bums, history buffs or party people. While all the advantages of staying in KW are obvious, we want to list the reasons why choosing 24 North as your place in paradise is the best option. Here’s part 4 of the 24 Reasons you should stay at 24 North. (Check out more 24 North perks in part 1, part 2, and part 3 of the series). Our onsite shop has beach essentials, drinks, snacks and souvenirs! Accessible from our hotel lobby, guests can pick up anything they forgot -- sunscreen, sunglasses, or beach coverups. Latitude Supply Co. also has locally-made items on its shelves, perfect for small gifts: salt scrubs and the funky-yet-elegant works of Key West Pottery. Make sure to stop in while you’re at 24 North! Ah, the perks of friendship. As a guest of 24 North, visitors can enjoy events and activities going on at The Gates Hotel, located right next door. Whether it’s Yappy Hour at their onsite bar Rum Row, access to their onsite food truck or share events at Sunset Green Event Lawn, there’s always something going on between the two hotels. Check out the event calendar to see what’s in store while you’re in town. At 24 North, you can enjoy a room with a view. 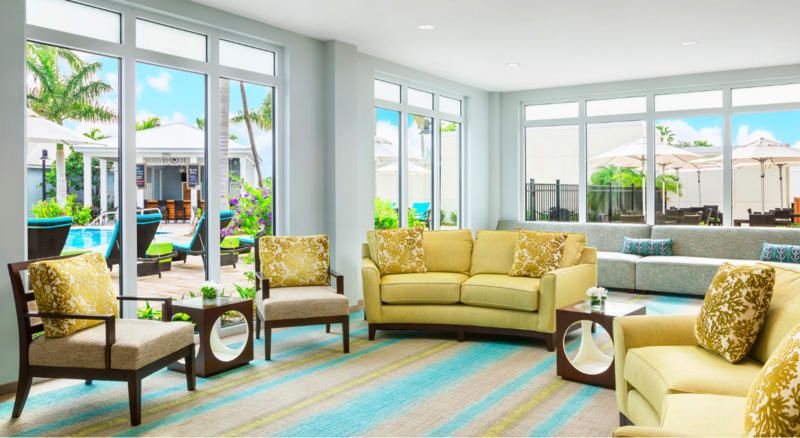 Many of our rooms offer a glimpse of the beautiful Florida Straits or the pool. When you call for booking, see what’s available. Planning a trip to Key West? Enjoy all the perks of 24 North Hotel.